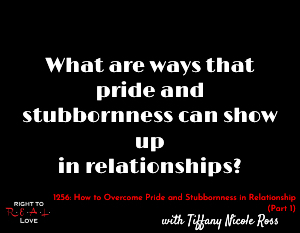 In this episode, Yahnathan is joined by inspirational speaker Tiffany Nicole Ross to address the question: What are ways that pride and stubbornness can show up in relationships? What are ways that pride and stubbornness can show up in relationships? The presence of pride and stubbornness in relationship. Differences between pride and stubbornness. How to identify pride in relationships.